Welcome to the jungle, we've got fun and games. We got everything you want honey, we know the names. We are the people that can find whatever you may need. If you got the money honey, we got your disease. Does a set of song lyrics actually exist that describe a band so perfectly. Hell No! When the talks of a GNR reunion started circulating there was a lot of skepticism. Maybe even rightfully so. The issues that divided the core of the band were well documented so when the reunion was made official the choice of names for the tour was perfect. Not In This Lifetime! The fans waited with anticipation as the stage was set, the crew had left and the lights were on. Then the classic GNR double guns, circle logo (shown above) appeared on the screen behind the drum kit and the guns started shooting. The stadium went black and of all things to start playing...the Looney Tunes theme. The guys hit the stage, the noise was deafening and that's when it hit me..this is gonna happen. GNR opened with "It's So Easy," followed with "Mr. Brownstone" and then "Chinese Democracy" which actually surprised me and it was the first of three Chinese Democracy album songs that were played that night. 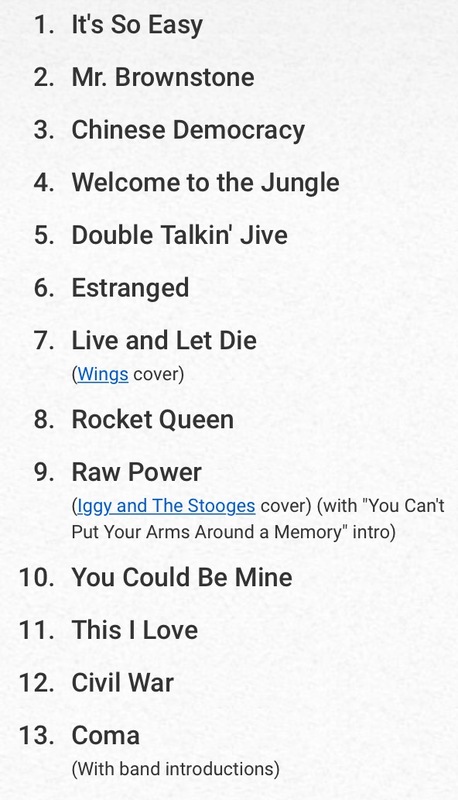 My surprise was not because "Chinese Democracy," "This I Love" and "Better" are bad songs, quite the opposite, however with Slash and Duff McKagan not being with GNR when that album was recorded I was curious if they were going to play any of those tunes. I got my answer three songs in. Then "that" intro started playing, that guitar riff is universally recognized, the intro to "Welcome To The Jungle" and it was played flawlessly. I've never seen that many people excited and singing so loud. Guns N' Roses played 25 songs, highlighted by their biggest hits and were phenomenal. The songs "You Could Be Mine," "Civil War," "Sweet Child O' Mine" and "November Rain" got the biggest reactions and "Nightrain" closed out the main set. Slash and Duff were stellar as always and I have to make mention of guitarist Richard Fortus and drummer Frank Ferrer (celebrating his tenth year with GNR) as they equally held down their parts and together the whole band killed. Then, there was Axl. The majority of what we hear about Axl Rose is on the negative side, he's late taking the stage, he'll leave the stage if he gets upset, he has issues with photographers but let's put that all to rest. Axl delivered a performance that was nothing short of incredible. He looked fit and his voice was very sharp with excellent range. His interaction with his fellow band mates was great to see and he truly looked like he was having a great time and to us as fans, that's what matters. After a chant of "G...N...R," "G...N...R" the encore started. "Patience" opened and was followed by a cover of The Who's "The Seeker." The gold-standard of finale songs "Paradise City," of course, closed out the show and featured a huge fireworks display from the top of FedEx Field with confetti spraying the crowd. I was honored and privileged to be a part of this event. It may never happen again but remember, 2017 is the 30th anniversary of Appetite For Destruction...just saying.